What is a potential conflict of interest? Is it a potential conflict of interest if the Comptroller hires her husband’s accounting firm to conduct the company audit? Absolutely! Is it a potential conflict of interest if a professor uses a text book he wrote for his or her class? Probably not, as long as the appropriate administrative officials at the university are aware of the situation. As you can see some conflicts of interest are obvious, others fall into a grey area and the circumstances define whether or not a conflict exists. You should always talk about potential conflicts of interest in a policy since the circumstances surrounding a situation determine whether or not a conflict exists. A Conflict of Interest Policy defines what represents a potential conflict of interest. All conflict of interest policies should be accompanied by procedures identifying in detail how someone should raise a potential conflict of interest, the process for mitigating conflicts of interest, potential resolutions for conflicts of interest and potential penalties if a conflict of interest is not mitigated. I recommend developing process flows to accompany conflict of interest procedures since they are generally easier for people to understand than a document. I also recommend including examples of potential conflicts of interest that may arise in your organization in your policy document. 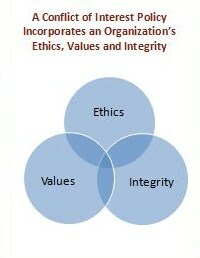 It is imperative that organizations hold their employees to the highest possible ethical standards. By identifying a potential conflict of interest early an organization can mitigate the conflict before the organization compromises their values. Are you ready to get started on your Conflict of Interest Policy? An initial consultation is only $100. Here is what you get. The $100 fee is applied to the cost of developing your Conflict of Interest Policy if you decide to use Jackie Willey. Jackie Willey is available for a free 30 minute consultation to discuss your Conflict of Interest Policy and help you develop the best strategy to meet your needs.